Fits neck sizes up to 27"
For Dogs over 8 lbs. Easily improve the communication between you and your dog. With three training options—tone, vibration and spray stimulation—you can ensure you will find a safe and reliable training method that allows you to correct unwanted behavior. The collar is rechargeable and water resistant. This unit uses replaceable and recyclable spray refill cartridges that provide approximately 35 sprays per use. They are safe and easy to use. One citronella refill and one unscented refill are included. The included handheld transmitter is capable of controlling a second collar so that you are able to train a second dog using the same remote. This requires purchase of a PAC00-16736 Add-A-Dog Receiver Collar (sold separately). 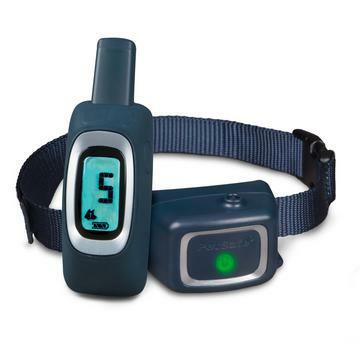 System includes: Training collar with adjustable, replaceable strap, digital remote, USB charger, product manual, 1 unscented refill cartridge and 1 citronella refill cartridge. Recommended for dogs 6 months of age or older and 8 pounds and up. Collar fits neck sizes up to 27 inches.